Every year, the whole city of Bhaktapur, Nepal, empties itself into the streets for over a week to celebrate Bisket Jatra, which starts four days before the Nepalese New Year and continues for four days after it. The multifaceted festival is a ritual welcome extended to the New Year and carries immense cultural significance for the people of the city. Two wooden chariots – one belonging to Bhairav, the patron deity of Bhaktapur City, and the other to Bhadrakali, Bhairav’s female consort – are paraded through the city streets on New Year’s Eve (April 12) as the central event of this festival. A symbolic collision of the two chariots represents the union of masculine and feminine, bringing promises of fertility in the new year. A wooden pole (lingo) measuring many metres in height, is erected in a nearby square the same evening, but is pulled down on New Year’s morning (April 13), symbolic of the destruction of evil in the beginning of the new year. The festival’s origins go back hundreds of years to the medieval age of Nepalese history, a golden age of Nepalese art, craft and architecture. It is believed to have started by the king Jagajyoti Malla. According to one legend, every male who married the princess of the city in those mythical times was found dead the morning following the honeymoon night. After a number of grooms lost their lives, one clever suitor decided to stay awake the entire honeymoon night. Soon after his princess fell asleep, a ferocious snake slithered out of a nostril. Acting quickly, he disposed of the monstrous creature with the help of his sword, bringing tremendous joy and relief to the denizens of the city. From then on, they have celebrated this undoing of evil through the ritual crash of chariots symbolising the consummation of marriage. The festival starts with the procession of the chariot of Bhairav from a place called Taumadhi. Mildly inebriated locals pull the chariot through the city as happy crowds mark its progress. As this supreme divinity embarks upon the journey, on this day all the other deities of the city are said to descend from their divine seats. All the temples of Bhaktapur open to the public for viewing and worship throughout the festival. As the festivities come to an end, the deities return again to their respective divine seats. 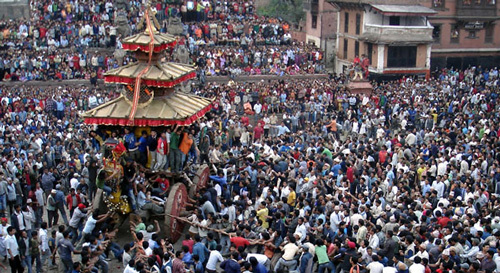 Although the chariot procession is a very important event, the people of Bhaktapur engage in celebrations throughout Bisket Jaktra. 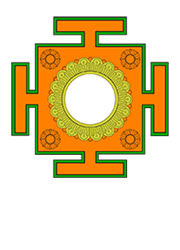 The city is divided into eight zones, each one presided over by one of the eight forms of the goddess Astamatrika (the ‘eight mothers’). After the first day’s procession, the goddesses are taken around the areas over which they preside. The principal one among them is led throughout the city. Following New Year’s Day, families feast together with their relatives for the remaining four days of the festival. The senior family members place a tikaon the foreheads of the younger ones and relatives exchange blessings. Known to all, Bisket is an important occasion that brings families, friends and relatives together to strengthen feelings of kinship. Light is shed on many aspects of the festival through interesting legends. In ancient times, when Bhaktapur was newly built, Bhairav is believed to have travelled all the way from Kansi, in India, to see the city. As the traveller Bhairav was a manifestation of the god Mahadev, and hence not an ordinary man, his head stood far above all other citizens of the city. The tantric leaders of Bhaktapur quickly noticed this strange feature and discovered the truth through meditation. Seeking to keep Bhairav in the city forever, they hurled a magic spell (tantra) at him to keep him from escaping. In his defence, Bhairav made a great effort to escape from the trap, but quickly met with an unusual fate. As Bhairav struggled to free himself, his head was severed from his body. Free of the spell, his body ran back to Kansi. Today, a statue in Kansi consists only of his body, while the ones in Bhaktapur bear only his head. When the lingo(wooden pole) is erected in a town square on New Year’s Eve, the body of the deity is summoned from Kansi by beating at the bottom of the pole. The clamour Bhaktapur is said to be heard in Kansi. Other interesting myths and beliefs are associated with the Betal, a ferocious-looking copper statue, the duty of which is to serve as Bhairav’s bodyguard. This mischievous deity is a source of fear to the people, so much so that it is tied tightly with ropes all the time, even in the chariot. People believe that Betal dons different facial expressions every year. A bright expression bodes ill for the town and for the conduct of the festival itself, with the connotation of violence and death; an angry look bodes well for the city. In the ancient municipality of Madhyapur, the Newars of Thimi have their own spectacular ways of celebrating this festival. On the second day of the New Year they exhibit Balkumari Yatra. Over 20 palanquins, carried by men and followed by their own musical bands and processions, travel three times through the town. The participants throw vermillion (a blood-red powder called sindur in Nepali) and other colours at each other and sometimes also at spectators. That is why this event is also known as Sindure Jatra. The processions all converge in the small space in front of the town’s Balkumari Temple for the final ceremony. The festival is hence known as Balkumari Yatra. In Bode, another village in Bhaktapur District, the New Year celebrations are strikingly different, by virtue of a tongue-piercing ritual performed by one of the local farmers on the second day of the Nepalese New Year. Whether it is Bisket Jatra in Bhaktapur, Indra Jatra in Kathmandu, Krishna Janmashtami or Bhoto Jatra in Patan, Chhath in the Madhesh regions, Lhosar celebrated by the Kiranti communities of Nepal, or nationwide festivals like Dashain and Tihar, Nepal offers a great many (and at times bewildering) celebrations. Festivals in Nepal are often associated with deep-rooted religious faiths and traditions, but also have the benefit of bringing people together and inspiring them to celebrate communally. For visitors, there are great varieties of food and drink to sample, and music, dances and carnivals to enjoy. Everyone is welcome to participate! The parades are sure to bring a great dose of excitement and lasting memories, so why get left behind?